Arniston is a leisurely two-hour drive from Cape Town via the beautiful hills of the Overberg region. The Arniston Spa Hotel is privately owned and managed and set in a most exquisite location, next to an old fishing village, surrounded by pristine beaches and nature reserves. Touched by the spray from the Indian Ocean, guests are welcomed by panoramic views of the unspoilt ocean and endless beaches. The luxurious 60 en-suite rooms offer all the comforts of a world-class hotel. The fully equipped conference venue is situated on the first floor and can host up to 100 delegates whereas our wine cellar is a more intimate venue for 30 guests - ideal for a board meeting or private dinner. Alternate dining options are available for groups to keep it fun, which includes the hotel restaurant, fish braai or traditional Kassiesbraai dinner. 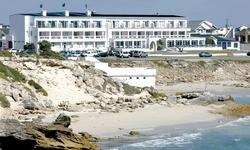 Arniston also offers a wide variety of relaxation and teambuilding choices.